lapetitemiette | all about food and other fun stuff! ~ all about food and other fun stuff! This week’s recipe is Boca Negra (p. 253) in Baking with Julia. Boca Negra means “black mouth” and in a good way! This recipe is the most gooey, chocolatey cake I’ve ever tasted. The cake is topped with a white chocolate cream that is made first and left in the refrigerator overnight to set. I didn’t read the recipe before I started (like always) so mine only had a few hours to set, but it worked fine. I actually didn’t like the cream very much and would prefer whipped cream. 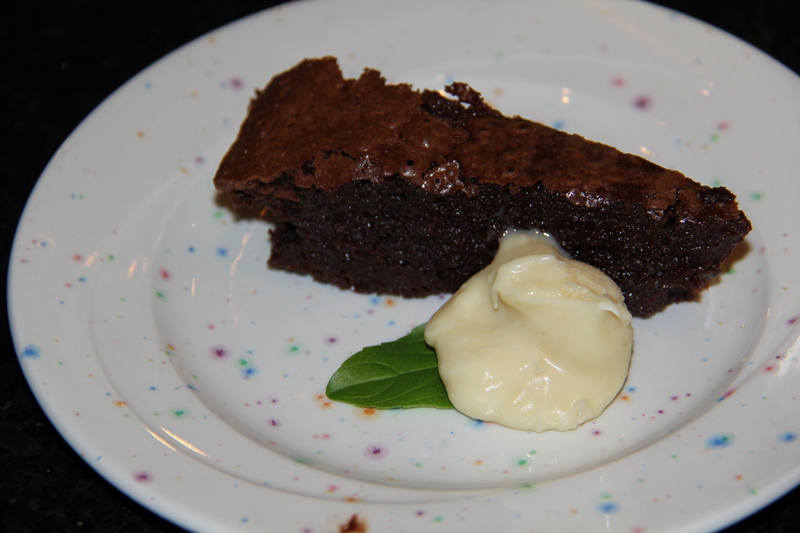 The chocolate of the cake is so rich, whipped cream would work best to highlight the deep chocolate flavor. I used the best bittersweet chocolate I could find . I also substituted Frangelico for bourbon but I couldn’t really taste it in the finished product. I wonder if bourbon would have been better. It was actually easy to make. I made the sugar/Frangelico mix, cooked it and added it to the chocolate. I mixed by hand and then added 1/2 the butter mixing by hand and added the rest of the butter, eggs and flour in my KA using the instructions for the food processor. I baked the cake for 45 minutes, 15 minutes longer than the recipe suggested since the top was not cooked at 30 minutes. The cake was gooey and delicious. Thumbs up! with whipped cream next time.